Did you know what the most revolutionary car in Jaguar’s production history is? Did you know that the version of that car is the British carmaker’s first-ever fully electric model? Not to worry for too long looking for the name. 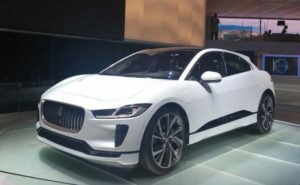 It is the 2018 Jaquar I-PACE! Drum rolls. When you think about the brilliant future ahead of Jaguar, this car shows that an innovative future is absolutely possible. The picture above is the final production-spec electric SUV. 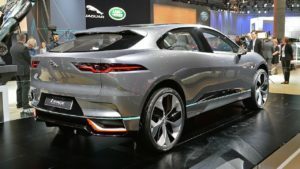 Orders for the 2018 Jaguar I-Pace opened in March 2018. More than 20,000 buyers have already registered their interest to welcome this all-electric crossover. The first deliveries are expected by third quarter of 2018. The prices start at £63,495 (excluding the government’s £4500 plug-in vehicle grant for which the Jag is eligible). Boot space is a massive 656 litres with the rear seats in place; but with the rear motor residing under the boot floor, there’s no provision for any spare wheel, whatsoever. The 2018 Jaguar I-Pace also gets a 27-litre storage binnacle under the bonnet. You may also find out that there’s lots of storage in the cabin, too, with a recess under the arms of the lower portion of the centre console, as well as a sizeable 10.5-litre compartment between the front seats. The 2018 Jaguar I-Pace has little similarity with any Jaguar to date. It’s new from the ground-up and comes built on a new EV architecture, at the core of which is a skateboard chassis that positions the 90kWh lithium-ion battery pack under the cabin floor. The source of energy on the I-Pace is from two inbuilt electric motors – one is positioned at the front spindle and the other is positioned at the rear spindle – that generates an equivalence of 200hp and 348Nm of torque apiece, or taken together, it generates 400hp/696Nm. Another thing about the motors is that they are compact (the drive spindles pass through them) and light (they weigh 80kg each), and having one at each end as described above has, in part, added to help the Jaguar achieve an ideal 50:50 front-rear weight balance. The 2018 Jaguar I-Pace weighs in at 2.2 tonnes (2,200kg). Jaguar claims that with a fully charged battery, it can go for a range of 480km. If you connect the charger to an AC wall, at home or in your office, it will take up to 10 hours to make the battery to be 80% full, but with a DC rapid charger, it can get to 80% within 40 minutes. 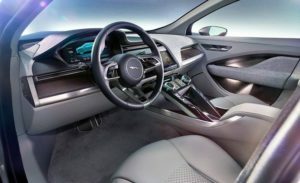 The dashboard of this all-electric crossover is new-age Jaguar and it features JLR’s latest Touch Pro Duo dual-touchscreen infotainment system. It does take some time to get used to the arrangement but Jaguar has made things easy for the newbie by retaining a chunky knob for temperature control settings. Digital instruments that let drivers switch between screens are standard, while top-trim cars get a head-up display, too. At the back, there’s impressive legroom. It feels really airy and the seats are all comfortable, too.